Whether it's sport or business, if you want to succeed, you have to know how you rate compared with your peers, to know where you need to improve relative to them. If you want to be the "best-in-breed" in online marketing for your sector, or just to "get more returns from online" you need a baseline to review marketing effectiveness against competitors. 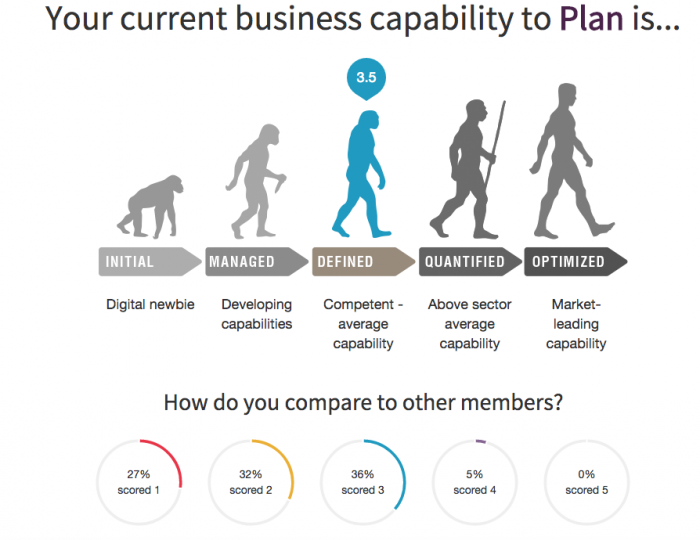 Dr. Dave Chaffey takes a closer look at benchmarking in the digital arena. Online, potential customers will often directly compare what a competing brand or site has to offer. Benchmarking features and the brand engagement of a site or online marketing "puts you in the customers shoes" and gives you insight on where you need to improve. It can also give you inspiration to try new approaches whether they're related to content, design or the brand communications used. 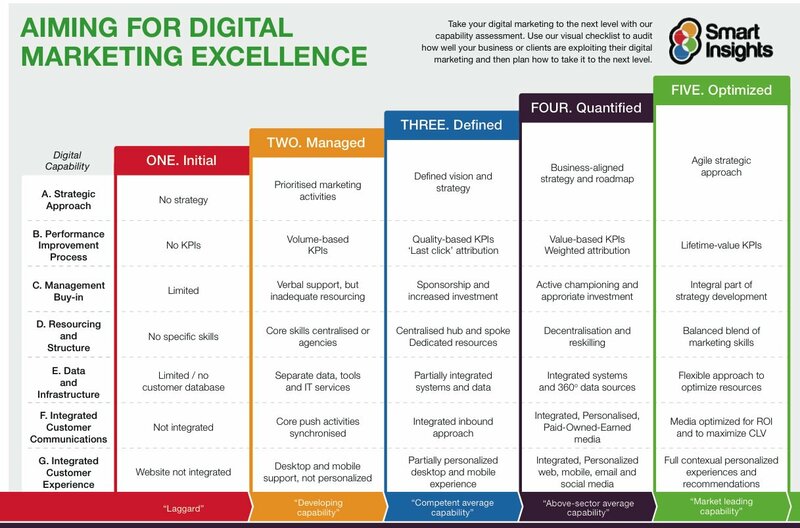 Given these clear benefits of benchmarking, I've long been a fan of it and when developing the resources at Smart Insights have created visual digital marketing review benchmarking charts for download to help marketers use this approach. Here's one example which can be used for assessing the overall approach to digital marketing of a business. In my role of developing good marketing practices at ClickThrough Marketing I've encouraged similar approaches throughout our work and auditing benchmarks of overall digital performance of paid or organic search are a regular feature of our proposals and regular client reviews. Communicate the current situation to colleagues budget holders and highlight investment priorities in for different activities. When working with clients to audit their digital marketing I have worked through spreadsheets with them to score their marketing, but for a long-time have wanted to create a more interactive tool. Well, I've finally made it and we have a free tool on Smart Insights that any business can now use to score their capabilities - you can find out more or try it here. Here's an example of the output covering strategy and planning for digital. The tool also covers the full customer lifecycle from our RACE Planning framework of Reach > Interact > Convert > Engage. I hope you find the tool or the approach useful. As I've said, benchmarking is useful at different levels of your digital marketing - whether it's reviewing the overall strategy, comparing performance in organic or SEO or if you're refreshing a website through a major redesign.